Stricken with salad fatigue? So are your vegetables. Get your greens (and reds, yellows and oranges) the modern way—by drinking them. Vegetable juices are plenty wholesome straight up, but take on a certain VIP appeal when they join the jetsetting cocktail crowd. A few adventurous couplings to start with: gin and celery; rum and red bell pepper; bourbon and carrots. The result? An explosive combination of color, flavor, vitamins—and a buzz you can feel a bit smug about. Have you boarded the beet train yet? If you’re still teetering between beet love and hate, this drink’s bold shade of rouge might make you a believer. A jolt of grapefruit cuts through the earthy beet juice and rosemary simple syrup echoes the herbal gin base. Finish the glass with a slip of club soda and you’ll struggle to remember why you and beets ever lived apart. Get the recipe. Save a salad; drink your kale. Juiced into submission along with Granny Smith apples and romaine lettuce, kale morphs into a “super” green juice. You can drink it straight, but isn’t that lush base better served in a Margarita? You’ll hear no argument from tequila or Cointreau. Get the recipe. To create this cocktail, you’ll need to play matchmaker with two unlikely characters: red bell pepper and golden rum. Shocking? Perhaps, but both share a natural sweetness that makes them surprisingly compatible. After a cozy “meet-cute” infusion period, the pepper-charged rum is ready for a night on the town with spicy ginger syrup, ginger ale, mint and a float of red wine. Get the recipe. Licorice lovers: Your time is now. Loaded with fresh fennel, fronds and fennel seeds, this infused-vodka cocktail extracts every last drop of essence from the aromatic root. All that flavor demands a sturdy sidekick. Enter verjus: the pressed, unripened grape juice that brings bright, lemony tang to the mix of fennel vodka, pear juice and orange bitters. Get the recipe. Don’t worry, no roadside weeds were actually whirled into this cocktail. The pale-green glow gives away its exact ingredients: gin, lime juice, agave and fresh celery juice. You don’t even need a juicer to extract moisture from those stubborn stalks. A quick puree in the food processor and a squeeze through cheesecloth produces a grassy, slightly bitter juice that walks hand-in-hand with gin’s bright botanicals. Get the recipe. Ladies and gentlemen: The award for most seasonal presentation goes to this delicata squash–ensconced tiki twist. Sure, it’s an ambitious endeavor, but won’t your guests be bowled over by a full-sized squash filled with an autumnal elixir of chai-infused rum, toasted pepita orgeat and pumpkin butter? Yes—a thousand times—yes. Get the recipe. Keep this carrot-forward coupe away from cottontails—they won’t know what hit ‘em. 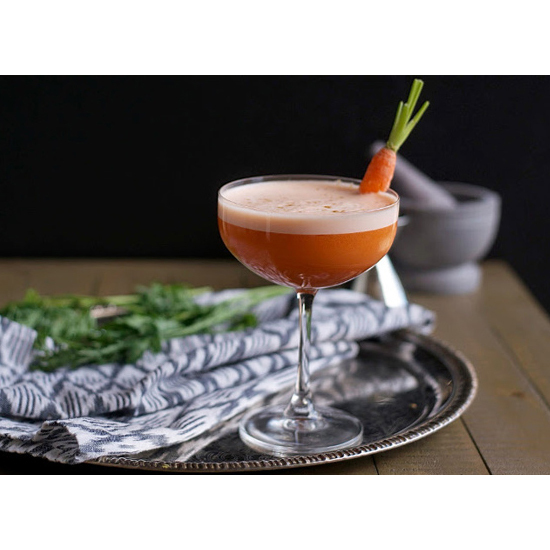 Fresh carrot juice tangles with toasted-cumin simple syrup and gives chase to the bittersweet duo of bourbon and amaro. Dot the top with orange bitters and soak up that boozy beta-carotene. Get the recipe.